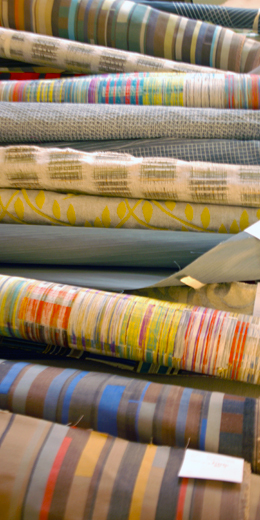 MTL is North America's most diverse and premier weaver of decorative furnishing products. MTL participated in the Proposte Fair in Cernobbio, Italy, for the 9th time in ten years. MTL profiled a variety of luxury textiles that featured classic and contemporary designs, using diverse design techniques, constructions, and qualities to highlight our great breadth of capabilities. On view were natural fiber jacquard & dobby flatwoven qualities in custom colors, utilizing both domestic and internationally-sourced yarns. Making a return to Proposte were MTL’s sumptuous velvets in a wide range of jacquard and dobby patterns using a range of natural and man-made fibers. And, to accommodate the needs of the contract market, we featured several patterns containing synthetic and natural yarns, woven to meet the rigorous requirements of high-performance fabrics. MTL is known as a special jewel due to our drive to innovate and experiment in the pursuit of new challenges. Our Proposte exhibit featured new yarns, colors and constructions, eliciting such comments from clients as: “refreshing”, “beautiful color and qualities”, and “thank goodness, something different.” Clients from all corners of the textile market around the world were impressed with MTL and the fact that our products are Made In America. Proposte is considered one of the premier interior furnishing trade shows in the world, and is “to the trade” only, catering to textile editors, upholstered furniture manufacturers, wholesalers, retailers, and textile converters. The show was attended by at least 6,000 visitors this year. MAILING LIST / Stay up-to-date with our most recent news.